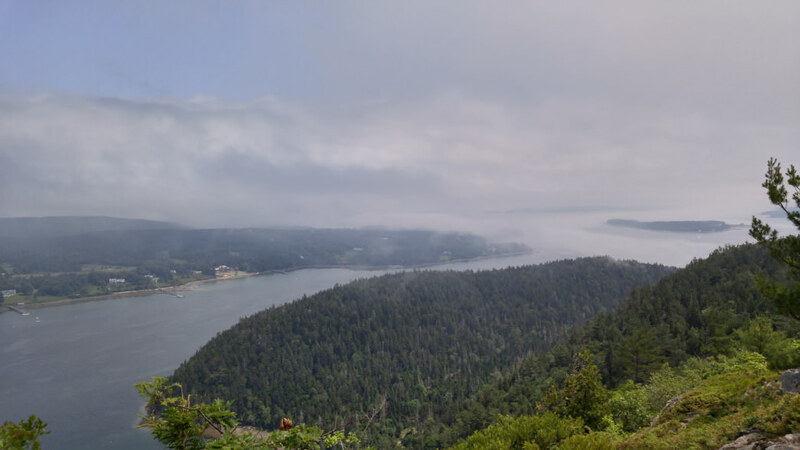 Sea mist and Somes Sound from Acadia Mountain. View of Somes Sound from St. Sauveur. Escape Acadia National Park's crowded eastern portion and head to Acadia Mountain and St. Sauveur. These two mountains provide wonderful views of Somes Sound, the only fjord on the East coast of the United States. The full loop is 3.9 miles. You can cut this distance almost in half by just completing one of the peaks as an out-and-back hike. A steep descent down Acadia Mountain as well as a steep ascent up St. Sauveur add a little bit of a challenge to this 3.9-mile loop. 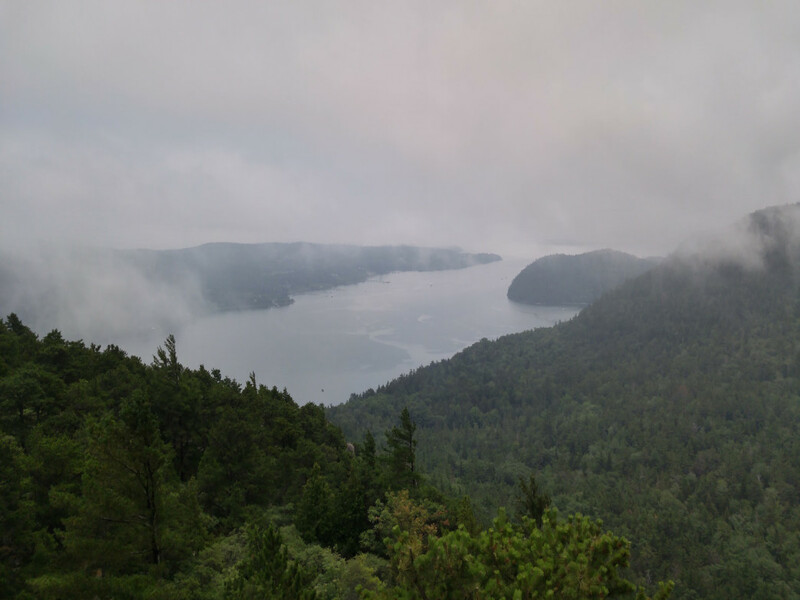 You will want to stop at the overlooks to soak in the beauty of Somes Sound and the eastern portion of Mount Desert Island. This hike is best completed when Acadia isn't frozen over in the winter and early spring. You will need to purchase a pass for Acadia National Park. A week pass is $25 for a non-commercial motor vehicle, and a seasonal pass is $50. Many of the popular national parks in the country tend to be very overcrowded during the peak tourist seasons. Acadia National Park, being one of the most iconic regions in Maine, is no exception to overcrowding. However, if you know where and when to go, the crowds are somewhat easy to avoid and you are able to witness the beauty of Acadia with a little more solitude. One of the best ways to accomplish this is to explore the western half of Mount Desert Island, which is typically significantly less crowded than the eastern half of the island. One of the best hikes here is the 3.9 mile loop around Acadia Mountain and St. Sauveur. Park in the Acadia Mountain parking lot and follow the Acadia Mountain Trail to the top of Acadia Mountain. It continues down the back of the mountain where you will come to an intersection. Follow the Valley Peak Trail, which is directly across and head up St. Sauveur. Climb up St. Sauveur and take the St. Sauveur Mountain Trail back to the parking lot. While Acadia Mountain and St. Sauveur are by no means the tallest mountains on the island, standing at 681 feet and 679 feet respectively, they provide some of the best overlooks of the eastern part of the island and of the beautiful Somes Sound, which is considered the only fjord on the East coast of the United States. While you will not entirely escape the crowds in this loop, an early enough start will provide plenty of distance between you and other groups hiking the mountains. And if you are adventurous enough, the lookouts from either of these mountains provide an excellent alternative to watching the sunrise as opposed to the highly commercialized Cadillac Mountain option. In the late summer, wild Maine blueberries grow bountifully atop most of the peaks in the area. You may find yourself sitting at an overlook snacking on blueberries and soaking in the view. On the overlook at St. Sauveur, you may catch a glimpse of one of the local peregrine falcons patrolling its territory. Avid hikers looking to escape the eastern half of Mount Desert Island and the crowds there are in for a treat if they start the day a little earlier than the majority of visitors. Even being on the trailhead by 8 a.m. should be an early enough start. As with most of the hikes here, you will want to be on the mountains on a clear day. Families with older children will enjoy the hike as well. Younger kids may have trouble descending Acadia Mountain and then ascending St. Sauveur. An alternative to the loop would be just hiking one of the mountains. Both provide a wonderful view with a climb kids should be able to manage. The drive from Portland to Acadia is a little under three hours. Taking 295 primarily cuts off some time, but a trip up Route 1 provides a scenic drive of coastal Maine and the small towns there. There are entrance fees into Acadia, and all purchased passes are valid for a week, which may be the excuse you need to spend a few days in the area. Exact fees can be found on the park’s website. The trailhead for Acadia Mountain is located on the western half of Mount Desert Island along Route 102. If you are driving south, you will pass the quarry on you left just before Acadia Mountain’s parking lot on the right. Going north, you will pass the entrance to Echo Lake on you left before you see Acadia Mountain’s lot on the left.